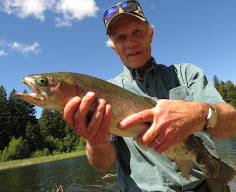 As the spring hunting season nears its end my attention is turned to a summer of fishing fun. The preparations for the fishing season go much further than just putting new line on the reels, checking all the lures, rods and doing maintenance work on the reels. Getting ready for the fishing season also means that I pay special attention to the boat and trailer, which have been parked all winter behind the house under a tarp. A few years ago I saw a horrific accident on the highway involving a utility trailer that had become disconnected from the towing vehicle and had turned into an uncontrolled projectile shooting at considerable speed across a two-lane highway. In it’s course the trailer hit a car that in turn veered off and hit another car. Two people died in that accident and one person was seriously injured. The main problem with pulling a trailer is user complacency. There is much more to ensure that your boat trailer is safe than just checking if it hooks up properly to the towing vehicle. When was the last time you checked the tires? Electrical connections? The straps that tie the boat to the trailer? The trailer brakes and other essentials that should be checked every time you hook the boat trailer up? Of course the same attention to detail needs to be paid to the boat. Check the boat for leaks and loose rivets, bolt and screws. If your boat is furnished with pedestal seats check the mounting plates and the seats themselves to make sure it is all in safe working condition. The engine is the heart of the boat. If you didn't change the oil at the end of last season, do so now. After running your boat all summer, it's likely that water, acids and other by-products have built up. It's important to change the oil to prevent corrosion and excessive wear, which can lead to loss of power, poor fuel economy or engine failure. At the same time you change the oil, be sure to change the oil filter too. Finally, replace the batteries if necessary and have them fully charged and then perform a test run on the engine and trolling motor before taking the boat on the water. Once you have the boat on the lake and the motor quits on you or wont start it is usually to late to wonder why. I still remember a particular fishing trip with a friend. We had been about a half hour on the lake when I noticed a puddle of water around my feet. “Where the heck is this water coming from?” I wondered aloud. We soon found the culprit. It was a small leak at the boat floor. The hole used to be home to a rivet that must have popped sometime during the winter storage. Had my friend have taken the necessary care and diligence to check the boat from bow to stern we would have been fishing instead of cussing and hurrying back to shore. Do yourself and other road users a favour and check your trailer and boat before you head out to your favourite fishing spot. With due diligence and proper maintenance of boat and trailer you can save yourself and others a lot of problems, even lives. I hope you all have a safe and enjoyable fishing season. Thanks for the informative post Othmar! May you catch many 'big ones' this season and have a fun and safe time too.